(Host) Flu season is just about here. But public health officials say that’s nothing compared to what they’re certain will eventually come: a worldwide flu pandemic. Health officials say Vermonters won’t be able to go out in public during a pandemic. So they recommend families prepare by stocking their pantries. VPR’s Ross Sneyd went grocery shopping with the health commissioner to learn more. (Sneyd) Vermont Health Commissioner Wendy Davis has her shopping list in hand. She says a pandemic will come. A good place to prepare is here, at a grocery store. Today, she’ll buy many of the things that a typical family of four would need to get by for two weeks. Public health officials anticipate families won’t be able to go to work, school or the store during a pandemic. (Sneyd) Burlington is one of nine communities around the country that are part of a pilot project with the U.S. Department of Health and Human Services. The goal is to be ready when a flu pandemic arrives. That’s right – it’s not if, but when. History tells us, she says, that a virulent, deadly flu strain will explode into a pandemic. That’s what happened in 1918 when the Spanish influenza killed thousands. (Sneyd) With so many people so sick during a pandemic, public health officials say society will have to shut down for a period. Business need to plan how they’ll operate for two weeks without their staff actually showing up for work. So, Commissioner Davis says, consumers should shop. The Health Department has a list of what people should stock up on. (Sneyd) A big jar of peanut butter goes in the cart – along with a couple jars of jelly, for flavor. There’s dried milk, raisins, nuts, cans of pumpkin and diced tomatoes. (Sneyd) She picks up a five-pound bag of pasta, flour, sugar. Even a jar of salsa. 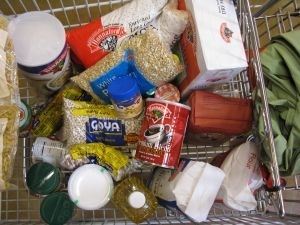 (Sneyd) After about a half-an-hour, the cart’s getting full. (Sneyd) The cart doesn’t have everything on the list. Commissioner Davis says consumers shouldn’t feel like they have to get everything at once. They not be able to afford it. Davis says pick up a few things on every run to the supermarket. Before long, you’ll be stocked. (Sneyd) To get a full supply, the Health Department figures, would cost closer to $200 for a family of four. Davis says families will be glad they made the effort when they’re stuck at home for weeks.